Home > Business Databases, company information, Data Analysis	> Company Identifiers in Datastream. Identifiers can take many forms (e.g. Company Name, Ticker, CUSIP, SEDOL, Datastream Code, ISIN) and be national, such as CUSIP for US / Canadian companies or international, such as ISIN (International Security Identification Number). The ISIN code incorporates the national identifier. For example, for Tesco PLC: GB0008847096, which includes the SEDOL (UK company identifier) code: 0884709. In seeking to further their dissertation research, MSc students often make use of more than one research database. Consequently, a typical scenario involves a request to import a list of company identifiers into Datastream, then conducting further searches to secure data, prior to analysis. The ‘Create List (From Range)’ function is useful in this regard. 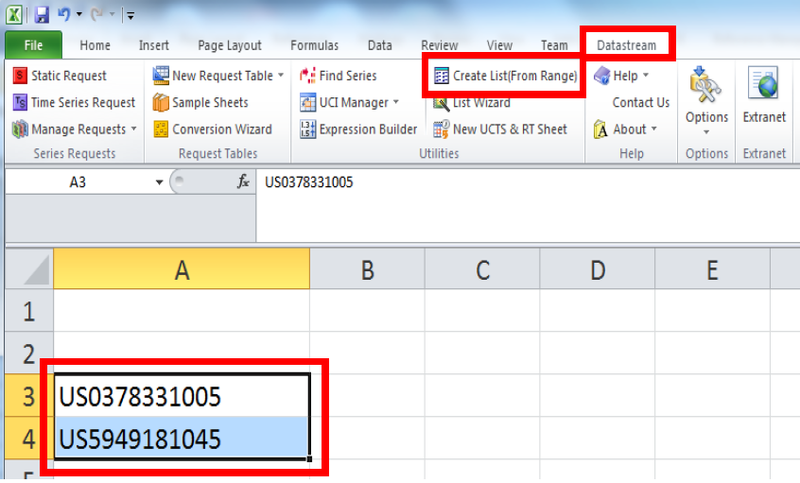 This function within the Excel Add-In version of Datastream is extremely effective when working with lists (up to 5,000 Series [companies] per list). This enables Company Identifiers to be copied and pasted into Excel and saved as a List on the specific computer being used (Store List Locally) or saved to the Datastream mainframe computer (Upload List) – accessible from computers with Datastream installed. The code generated to represent the list of companies can then be entered directly into a ‘Static‘ or ‘Time Series‘ request search screen in Excel. Hence, one or more Datatypes can be obtained for an entire list of companies and the results would be displayed in a single Excel sheet. Company Identifiers which work with the ‘Create List (From Range)’ function include: ISIN, Ticker, Datastream Code. Both Company Name and CUSIP don’t work, even though CUSIP is meant to. Within Excel, with the Datastream tab selected, enter (paste in) the company identifiers. Next, Select the identifiers (ISINs below) and then click on ‘Create List (From Range)’. To illustrate the process, a short list of two US companies will be used (Apple, Microsoft) – this could of course be a list of many hundreds of companies. From the ‘List Creation for Excel’ dialog box, the default option is ‘Store List Locally’ (on the computer being used at the time), with ‘Upload List’ as an option. This generates a confirmation message – click ‘OK’. The ‘List File Name’ [ New_0032.LLT ] is entered in the Series/Lists field in this Static Request (as at 03/06/2016) to locate: Company Name [NAME], CUSIP [WC06004], Ticker [WC05601], Datastream Code [DSCD] and Market Value [MV]. Results: widen columns as necessary, to display data. It would be possible to repeat the above process, to create lists with different identifiers (e.g. 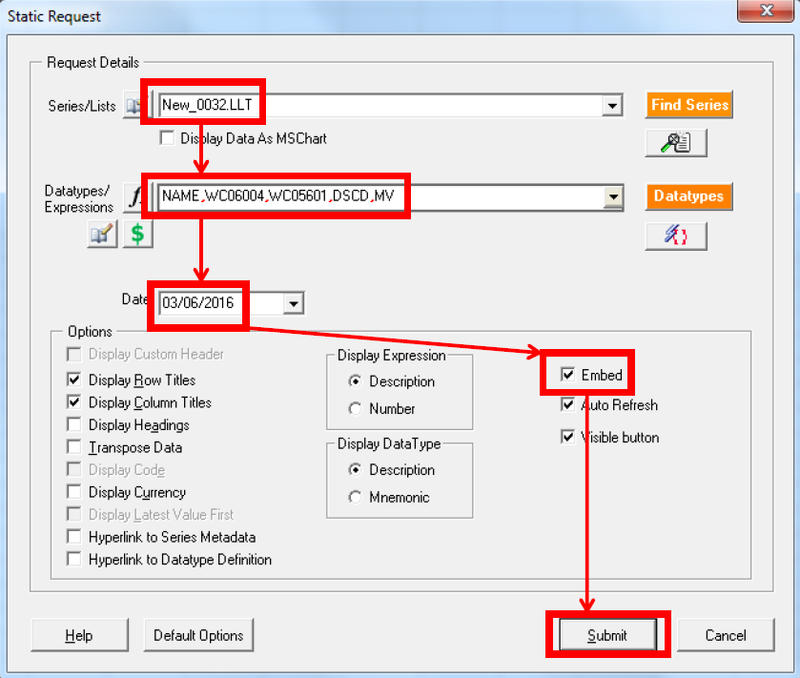 Datastream Code, Ticker) and also select ‘Time Series’ request for historical data. For Ticker identifiers, it is advisable to format the cells in the Excel column to ‘Text’ (before identifiers are pasted in) where US companies can have an ‘@’ symbol as part of the identifier (e.g. @AAPL, for Apple). 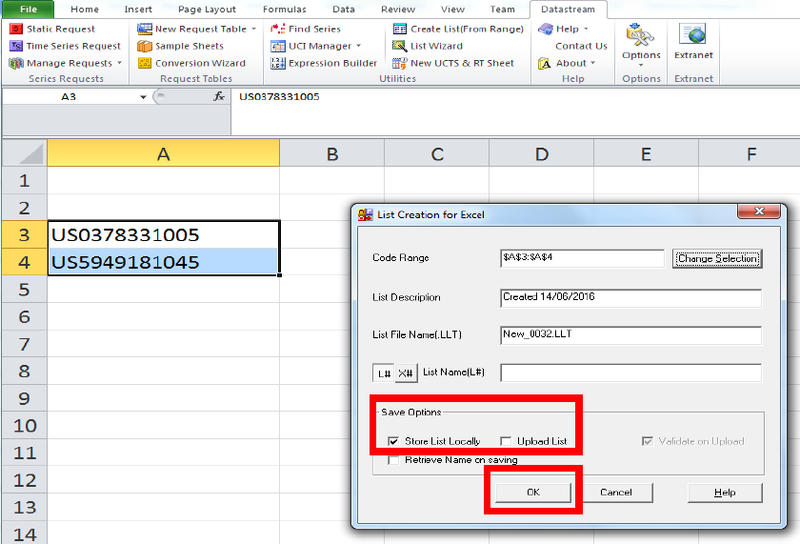 If the cells are not formatted as Text, the ‘@’ symbol will be interpreted by Excel as the start of a function. If a list contains both US and UK Ticker identifiers, this can cause a problem where an incompatible datatype is specified in a search request. For example, if CUSIP (datatype: WC06004) is included, this means the search will fail (i.e. it gives no results), as UK companies do not have CUSIP codes. Converting from Ticker to Datastream Code identifiers is a way around this difficulty. The Datastream Code identifiers could then be used to create a new list: for Apple (992816), Microsoft (719643), Tesco (900803) and J Sainsbury (926002). A Static Request (03/06/2016) search for datatypes: Company Name, CUSIP and Market Value is successful (i.e. it gives results) and merely has a blank cell under CUSIP for Tesco and J Sainsbury.